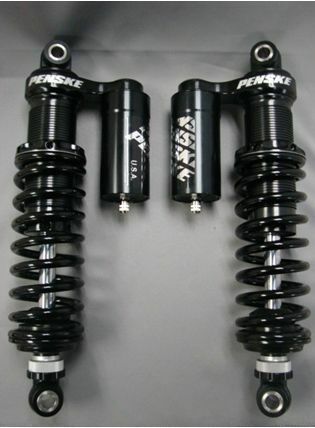 Penske Motorcycle Shocks- triple adjustable, 2-way adjustable,single emulsion, more... at MD Racing - your one stop performance shop for your motorcycle needs on the race track and on the street. Any of the following shocks are available in 'drag race build' at NO Xtra Charge. We just need to know if the swing arm is extended and by how much and if you want the overall length of the shock shortened. Call Matt. Compare the following features to any other motorcycle shock and you'll find that Penske Racing Shocks are the best available shocks to the serious racer. The 8900 series shock is completely owner rebuildable and revalveable if desired, resulting in fewer costly and visits to your service centre. Remote / integral reservoir contains increased nitrogen volume for more consistent damping over a long race. A floating piston separates the nitrogen from the oil, rather than a bladder type device that can fail. Fully CNC machined 7075-T6 aluminium construction. Hard anodised finish, making the unit both light weight and strong. Heavy duty 5/8" diameter chrome plated chrome-moly shaft. High quality spring steel valve shims make up the main piston valving, which can be changed by the owner to customise the damping characteristics of the shock. The best spring available - matched to your weight. 25 click rebound adjuster for extra fine rebound settings. Low friction / stiction shaft bearing and high quality seals and wiper to keep out dirt. Adjustable length eyelet, maximise rear ride height without removing the shock from the motorcycle. Read about our available options for the Triple adjustable, 2-way adjustable, shocks...read . ** Tech support is only a phone call away during your race week-end with your purchase. Private tech line number will be provided after each purchase. The 3 Way Adjustable Motorcycle Damper, utilizing the 8760 Series compression adjuster isthe ultimate tuning tool for the professional race team. The 8760 series adjuster offers separateadjusters for both high and low speed shaft movements. The high speed adjuster controls largertrack inconsistencies that may disrupt themotorcycle, while the low speed adjuster controls slow shaft movements such as corner exit squat. When the 3 way adjustable motorcycle damper is being compressed, the fluid is displaced into the adjuster and passes through a piston in the adjuster. When manipulating the high speed adjuster, the secondary valve shims are preloaded, giving different compression forces. The low speed adjustment meters the fluid and bypasses the piston in the adjuster, providing an adjustable combination of bleed and shim controlled damping. Rebound flow occurs through two (2) check valves. In effect, the combination of spring loaded adjustments will offer the ultimate tuning combination. In addition to the standard 8760 adjuster position, that has a more linear flow characteristic, the new Digressive CD Piston allows greater separation between high and low speed adjustments (i.e. less crossover) and has a more digressive characteristic for bumps and kerbs. This digressive adjuster also uses a shim return to enhance response. Please inquire about both types when ordering. ** Tech support is only a phone call away during your race week-end with your purchase. Private tech line number will be provided after each purchase. The orifices make every adjustment, have a noticeable "feel" and have increased the range of adjustment. At higher shaft velocities, oil passing through the orifice in the compression adjuster drum reaches a maximum flow rate because of the viscosity of the oil and the hole diameter. At this point any additional oil flow is metered through a blow off valve which bypasses the drum completely to ensure a linear adjustment range. Options will be available at checkout!